When attempting to view, query, modify or delete a DFS (Distributed File System) namespace with DFS Management MMC (DFSmgmt.msc), Distributed File System MMC (DFSgui.msc), DFSutil.exe, DFScmd.exe and other DFS tools, one or more of the following errors may occur, and you cannot perform any view, add, modify or delete any namespaces and their properties. \\domain.com\namespace: The Namespace cannot be queried. Element not found. \\domain.com\namespace: The Namespace cannot be queried. The RPC server is unavailable. \\domain.com\namespace: The Namespace cannot be queried. Access is denied. DfsUtil: Specified registry entry was not found. Could not complete the command successfully. SYSTEM ERROR – Element not found. These namespaces will be marked with red “X” icon in the DFS Management tool. Once it’s determined that the namespace is having error, the ability to create new folder, delegate management permissions, delete and view properties is removed from the available actions. It also hinder the ability to create and add new namespaces, especially if you want to replace the namespaces with the same name. The issue occurred because the affected domain-based namespaces that gave error have been removed from the namespace server that is hosting the namespaces, but are not deleted from AD DS namespace configuration. In other words, the namespace is orphaned. Active Directory Domain Services (AD DS) stores domain-based namespace configuration data in one or more objects that contain namespace server names, folder targets, and various other configuration data. The namespace servers maintain shares for each namespace hosted. The registry keys on the domain-based namespace servers store namespace memberships. Thus, if the DFS namespace configuration data stored in these locations is not in sync, is missing or inaccessible, you may be unable to manage the namespace, in addition to be bombarded with many different error messages. Important: Make a backup first before proceeding to perform any manual edit or AD data. Open the ADSIedit.msc tool, which is installed with the AD DS role or tools. In Windows Server 2003, it’s available Windows Server 2003 Support Tools. 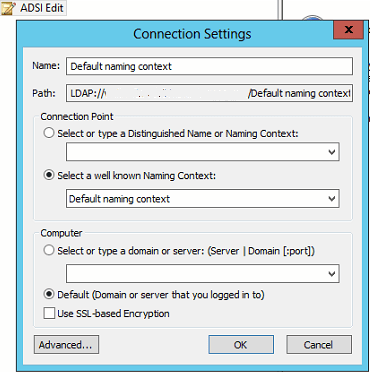 If you’re not connected yet, right click on ADSI Edit, choose Connect to Default naming context. If your environment is different, choose the domain partition of the domain hosting the domain-based namespace. Where the <domain DN> placeholder is the distinguished name of the domain. Identify and select the appropriate malfunctioning, inconsistent or orphaned namespace such as the “fTDfs” (Windows Server 2000 mode) or “msDFS-NamespaceAnchor” (Windows Server 2008 mode) object. Delete it together with any child objects. Optional: Run repadmin /syncall to speed up the sync of change to other domain controllers. Optional: Run dfsrdiag pollad on DFS namespace host servers to manually start the sync from AD. In the namespace servers, launch DFS Management console. Right click on the orphaned, malfunctioned or inconsistent namespace, and then select Remove Namespace from Display. Note: If you face other issues with DFS and namespaces, KB977511 is a useful guide to identify the object that is associated with the malfunctioning or inconsistent namespace and ensure that the namespaces are in sync. If you’re facing duplicate or existed namespace name when creating namespace, checkout the solution here.